Fall is upon us and the summer gardening season has pretty much ended – a few tomato and pepper plants remain, but most have been removed. It came on suddenly, hot in the 90s very early in the season and the temperatures reached heat indexes of over 100 – now all the sudden it’s Chilly! The cooler weather is welcome and fall colors have to be some of the most spectacular of the year; just hoping those cold snowy days don’t arrive too soon! 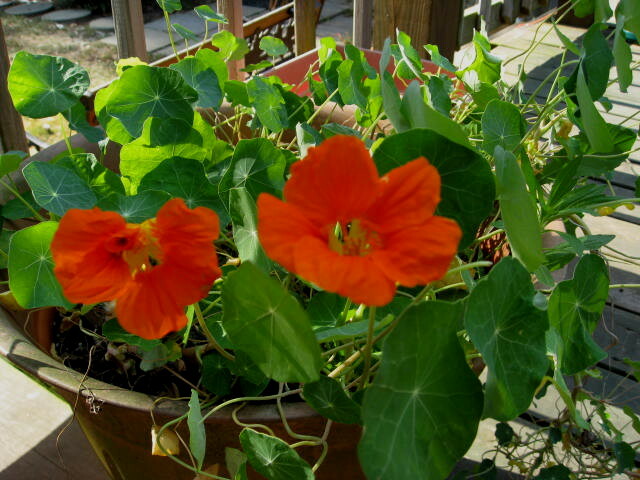 The Nasturtium flowers continue to grow and bloom in the container on the deck and I am sure they will flourish up until a frost covers the ground. 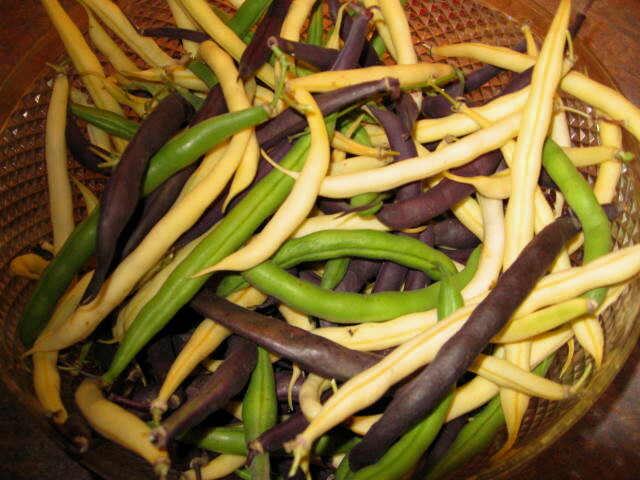 I also planted and just recently harvested TriColor Bush Beans also received from Renee’s Garden and I will be blanching and freezing these later this afternoon. I have some mini pumpkin gourds I will be working on this week and these were actually from last year’s harvest. My mini gourds this year didn’t take off like I had hoped so I only have a few and they will have to dry before I can work on them. 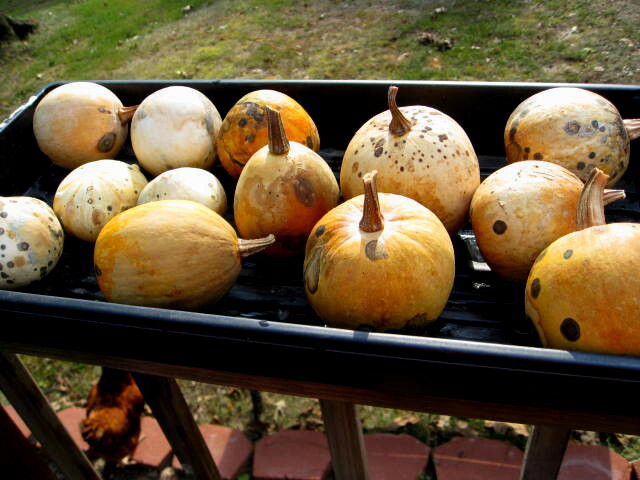 The larger gourds are still out in the field and they were doing great until the 115 degree weather hit and I was not there to water them – they suffered, but I will have some gourds regardless. Mini pumpkin gourds setting in the sun to dry after I washed and scrubbed them getting ready to decorate. I want to Thank everyone that entered the Garlic Giveaway and we did announce the winner last week … this will be the last week the garlic is listed for sale in the shop; then it’s Garlic Planting Time!!! Thanks again and Happy Fall! nasturtium flowers and leaves are edible as long as you don’t use pesticides. Yes …thank you for the mention and reminder on that! The nasturtiums seem to be enjoying the cooler fall temps. They just didn’t care for summer… here, anyway. A fun project. Enjoy your Fall! oh I agree …the nasturtiums had a tough time with the extreme heat here and are happy as heck now! Enjoy your Fall also and thank you! How cool that you still got blooms going. They’d probably compliment your beans if you added some of the blooms and leaves to a dish. That would make a beautiful cover to a cookbook – the tricolor beans and the orange nasturtium flowers!!! That’s a suggestion for your next GROW project – a community cookbook where everyone submits a blog post monthly of a dish they made with harvest from the garden! That’s a good idea, although seems like it would involve more work than my lazy self would want to put into it. Ha! If you’re game you could borrow the GROW project idea and modify it for cooking/recipes post like this idea. Hey, I tried to reply to your message via Email but I got a failure notice . So, I’ll just copy/paste the Email here. Feel free to moderate the message.